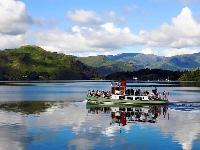 Traditional lakeland launch on Coniston Water running a cruise and ferry service to 7 jetties. Enjoy a round trip or stop off at one of the jetties and walk back, or sail-walk-sail. Disabled access : Disabled access with some mobility. Whilst we can carry a wheelchair on the launches we cannot, at present, board a totally wheelchair dependent person. Opening Times : Northern Cruise-Hourly from 10.45am to 6pm (45 minutes). Southern Cruise - 4.40pm (110 minutes) Mon-Thurs only. Last Admission : Last admissions: 5.45pm. Admission Prices : Northern Cruise return Adult £10.50, children half price. Southern Cruise return Adult £15.50, children half price. Single journeys from £3.